This recipe for the cakes of the king or Galette des rois has everything to make your preparation seem royal and elegant! The piping hot flaky layers wrapped over subtle flavors of apricot jam and nutty crunch really goes amazingly well with the warm aroma of rum. You may replace apricot jam with any other preserve of your choice or even thick hazelnut chocolate spread or chutneys of your choice. Adding this wonderfully flavored combinations kind of lifts the overall eating experience of this very amazing preparation. And, you must not forget to put the additional surprise or feve that must be placed randomly between the two layers of dough. Trust me either it’s the kick of finding feve under the buttery crunchy crust or mere delight of enjoying a delicious preparation, either ways you will never have to worry on how to store leftovers of this preparation. No one can have enough of galette des rois! Preheat the oven at 200 degrees C and prepare a baking tray by lining it with an aluminum foil or a butter paper. Divide the dough in to two halves. Lightly flour a clean and dry work surface and roll one half of the dough in to a circle of about 12 to 15 centimeters diameter. Carefully place this round on to the prepared baking tray. Spread apricot jam over the rolled dough surface evenly. Make sure you leave at least 1 to 2 centimeters from the edges of the circle plain and not spread the jam over that area. In a cup whisk the butter and powdered white sugar until light and fluffy in consistency. Add the egg, almond, rum to the butter mixture and beat everything well until the mixture is light and smooth in consistency. Spoon the butter mixture over the apricot jam layer and spread it evenly all over the jam layer. Place feve anywhere over this layer and press it a little in to the dough. Now, roll the second half of the pastry dough, just like the first one, both in thickness and dimensions. Brush the plain edges of the rolled dough with water and carefully place the second dough layer over the first one so that both the dough layers are closed almost equally at the edges. Press the edges of the circle a little to seal border of the dough rounds. 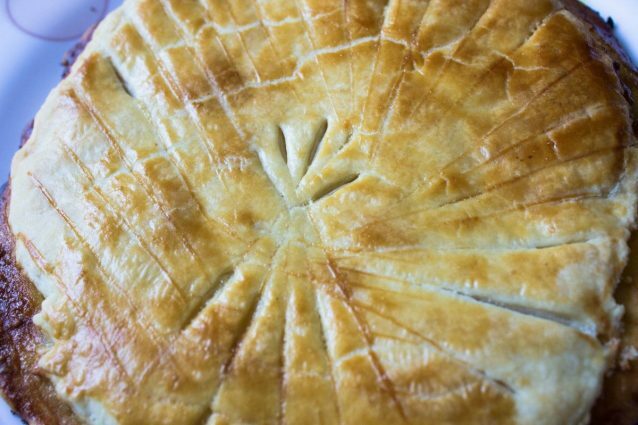 You may decorate the top of the pastry dough with a knife and then brush the top of galette des rois with a lightly beaten egg. Transfer the baking tray in to the oven and bake it for about 20 to 25 minutes or until it turns golden brown on top and cooks at the center. Slice and enjoy! You may replace dark rum with brandy or cognac of your choice as well in similar quantities. If required, you may use low fat milk instead of full fat milk. Try to spread the preserve or the jam within the 2 centimeter border kept plain to seal the two layers of the dough together. Galette des Rois with custard: a sweet dessert! Easy cherry desserts to try right now!